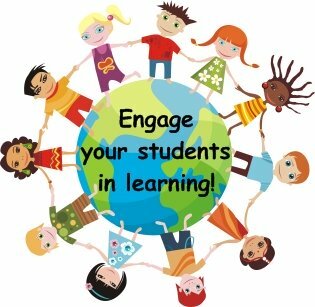 Welcome to my February and Valentine's Day Teaching Resources web page for teachers. 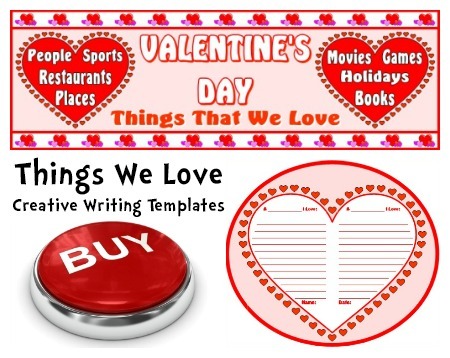 On this page, you will find Valentine's Day and February teaching resources for English, powerpoint lesson plans, bulletin board displays, and printable worksheets for creative writing assignments. Since Valentine's Day is not a very large holiday, I have not created as many themed resources for this page as I have for some of the other months and holidays. 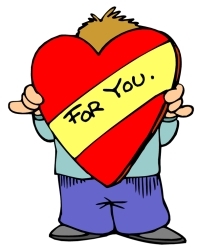 All of my Valentine's Day teaching resources can be found on this page. 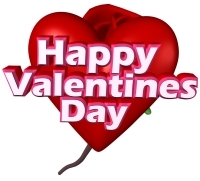 10 Valentine's Day resources that are available on this page. Valentine's Day Noun Powerpoint is provided below. 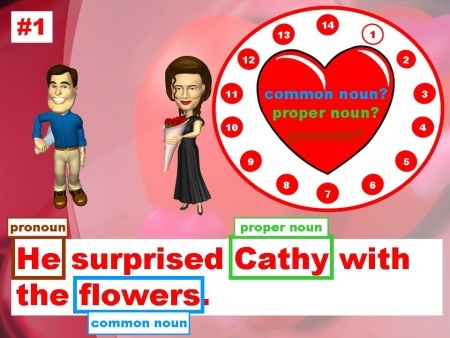 There are 14 sets of questions and answers in this Valentine's Day Nouns powerpoint presentation which contains 37 slides. 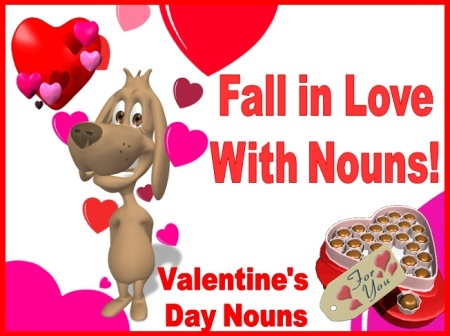 This powerpoint lesson reviews common nouns, proper nouns, and pronouns using a fun Valentine's Day theme. Below is an example of one of the question slides. Below is an example of one of the answer slides. 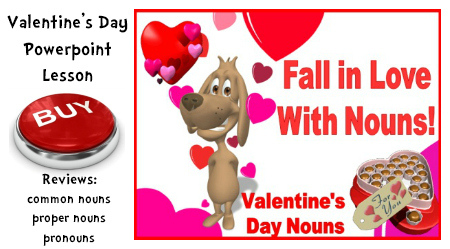 This Valentine's Day powerpoint presentation includes a student response answer worksheet. By using this student response printable worksheet, your students will be actively engaged in participating in this review of common nouns, proper nouns, and pronouns. 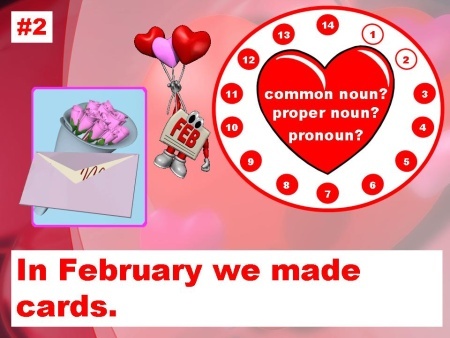 Click on the link below to download a free sample of this set of Valentine's Day powerpoint lesson plans. 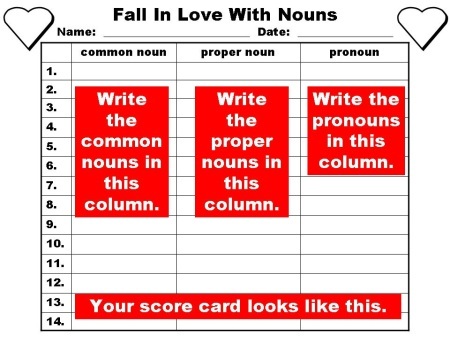 This Fall In Love With Nouns sample will show you an example of a question slide, and this is the section where students write their answers on their response worksheets. 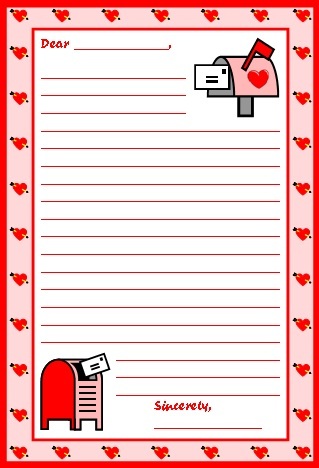 Valentine's Day sticker chart set is provided below. 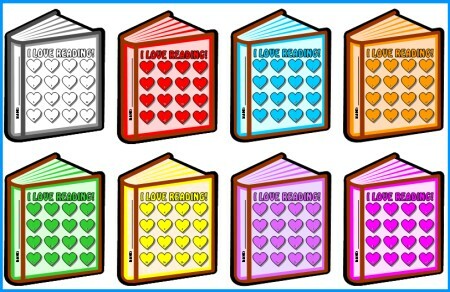 "I Love Reading" is a sticker chart set that will motivate your students to read at home during the month of February. 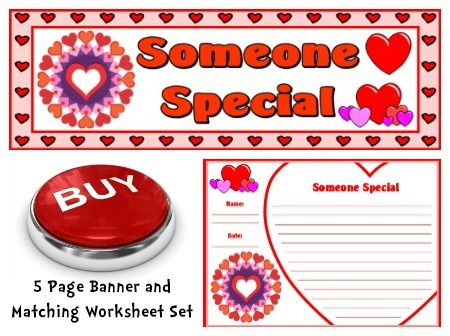 These Valentine's Day teaching resources contain 30 pages of printable worksheets. You can cut out these reading sticker charts along the thick black lines to have unique book shaped reading sticker charts. There is one black and white book template and 7 different colors of book templates for you to choose from. 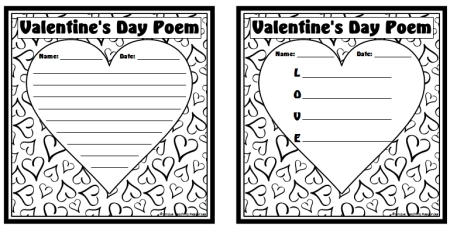 Below is the black and white template and the red template that can be used for a February and Valentine's Day reading display. 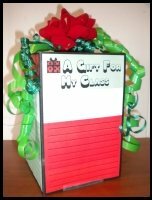 This set can be used any time of the year to promote and encourage reading. I have included 6 other colors of templates for you to use if you are using this set during other months of the year. 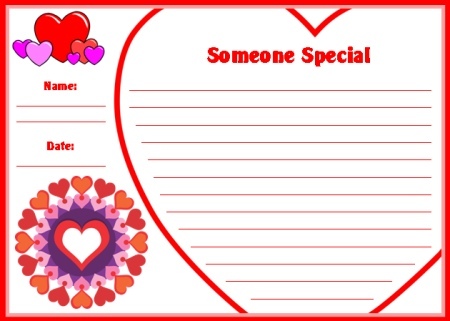 Since this set can be used any time of the year, I have designed a separate bulletin board banner that does not have Valentine's Day graphics on it for you for use during the other months of the year. Below: This set includes 8 colorful books to use as bulletin board accent pieces to help you create your eye-catching bulletin board display. It's COOL To LOVE Reading! 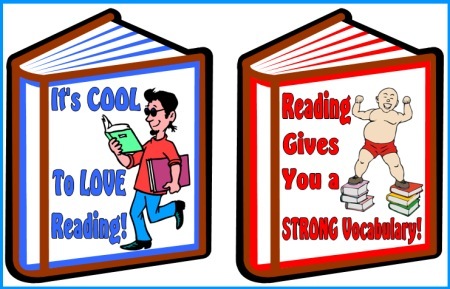 Reading Gives You a STRONG Vocabulary! 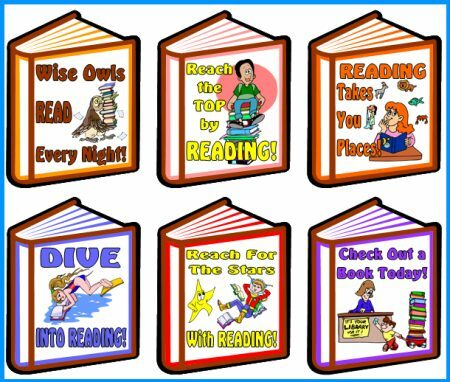 Wise Owls Read Every Night! Reach for the TOP by READING! Reach For the Stars With READING! Check Out a Book Today! 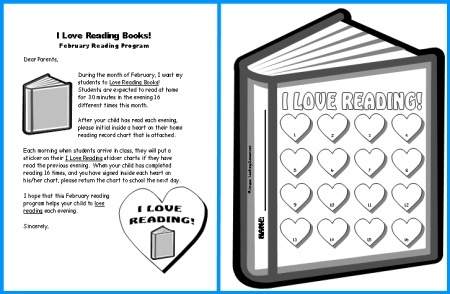 Below: This set includes a student award certificate that you can present to your students when they have completed their I Love Reading sticker charts. A black and white copy of this award certificate is also included in this set. Valentine's Day Value 4 Pack Set is provided below. Set 1: I Love This Book! February and Valentine's Day is a perfect time for your students to fall in love with reading! I use Valentine's Day as an opportunity for my students to each share a book that they recommend (and love!) reading to their classmates. 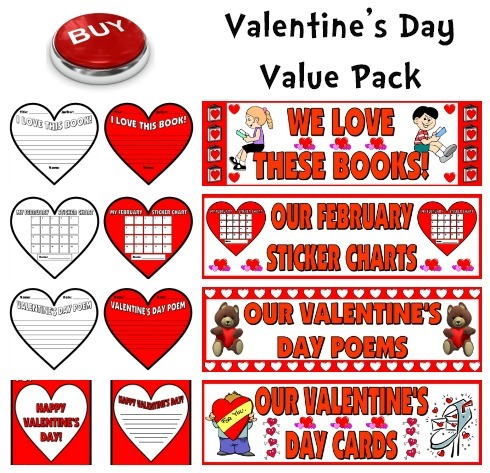 This set of Valentine's Day reading resources will also make a great bulletin board display that promotes reading in your classroom. 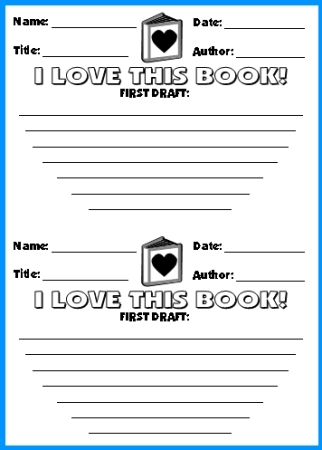 For this reading response activity, students write about the topic: I Love This Book! You can use this set of resources for students to write a short description about their favorite books. On Valentine's Day, you can have your students prepare short oral presentations about the books that they love and recommend. When students listen to book recommendations by their classmates, they will also be inclined to want to read those books. This I Love This Book! teaching resources set contains a first draft printable worksheet for your students to use. Even though this is a short reading response activity, I still like my students to complete a first draft of this assignment. Since these reading hearts will be displayed on my classroom bulletin board, I like to minimize careless errors on student work that is posted in my classroom. There are 2 copies of the first draft on each worksheet to save space and copying paper. Cut the printable worksheets in half and give one first draft to each student. After my students have written their first drafts and proofread and edited them with a partner or myself, I give my students their final draft heart templates. There is a black and white heart template for you to give to your students and a color heart template for you to use as your example that you show to your students. 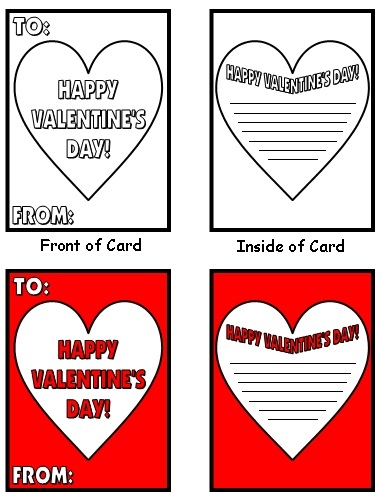 There are two different sets of Valentine's Day card templates to choose from in this set of teaching resources. The first card is a heart shaped writing template that matches the I Love This Book! heart templates in the above reading set. The second is a traditional rectangular card that has a cover and opens up to reveal the message written inside. I have my students complete 2 final drafts of their cards, one card they give to someone and the second copy of the card is for our classroom bulletin board display. 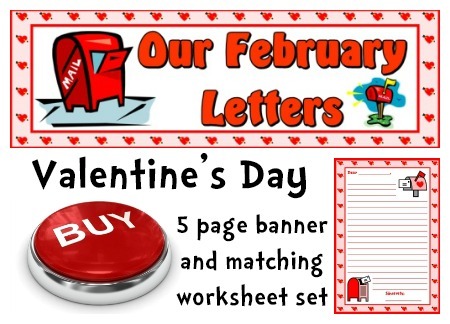 This Valentine's Day card set contains a 5 page bulletin board display banner for your classroom. 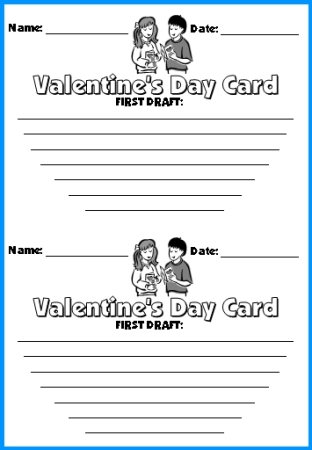 Below: This Valentine's Day card teaching resource set contains a first draft printable worksheet for your students to use to begin this assignment. Even though this is a short writing activity, I still like my students to complete a first draft of this assignment. I do not want my students to take home cards to give to their parents that contain careless errors written on them. After my students have written their first drafts and proofread and edited them with a partner or myself, I give my students their final draft card templates. There are two different versions of cards for you to choose from. The first set is a heart template that matches the I Love This Book! hearts. There is a black and white heart template for you to give to your students and a color heart template for you to use as your example that you show to your students. The second set of card templates is a two page rectangular template. There is a black and white card template for you to give to your students and a color card template for you to use as your example that you show to your students. 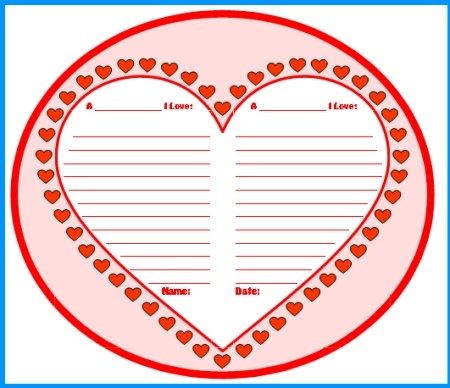 During the month of February, use these heart shaped sticker charts to motivate your students to reach a goal that you have set for them. 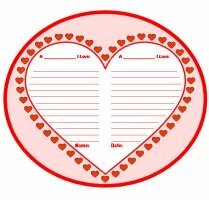 These heart shaped sticker chart templates match the hearts in the previous two Valentine's Day teaching resources. You could use these sticker charts to record homework, reading, acts of kindness from the heart, behavior, or for a topic related to your curriculum. 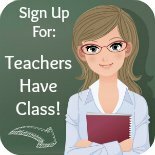 5 page bulletin board display banner for your classroom. 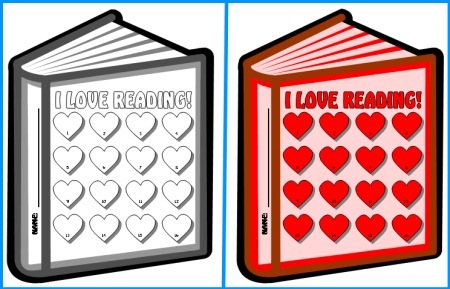 There is a black and white heart sticker chart template for you to give to your students and a color heart sticker chart template for you to use as your example that you show to your students. 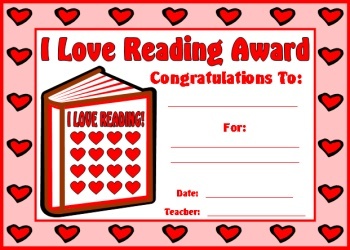 After your students have completed their February sticker charts, reward them for their achievements by presenting them with an award certificate. There are color and black and white copies of this award certificate in this set of teaching resources. 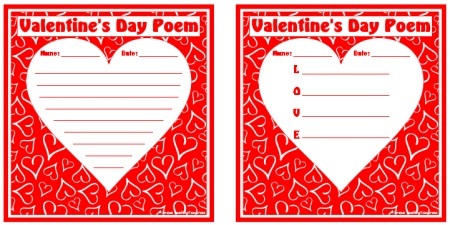 Valentine's Day is a good opportunity for you to present a poetry lesson to your students. For this creative writing assignment, I have my students write a poem about something that they love. 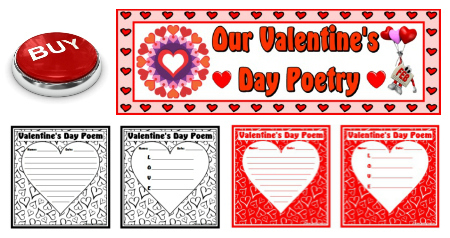 These heart poetry templates match the previous Valentine's Day teaching resources and I have designed these 4 sets of resources to compliment each other. 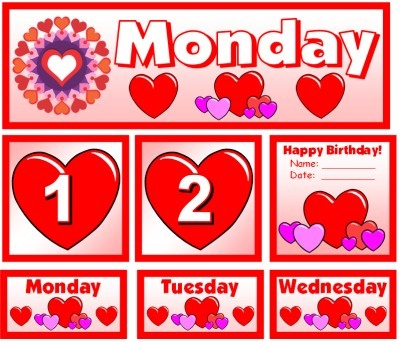 These 4 resources have heart shaped templates that match, the same font is used throughout the 4 sets, and the bulletin board display banners contain similar color schemes. 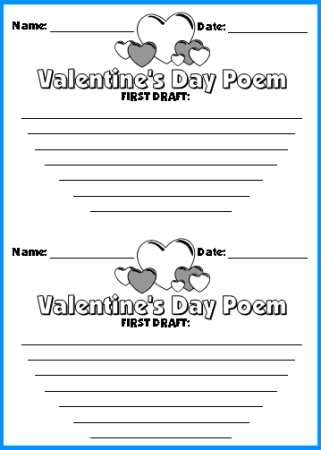 This Valentine's Day poetry teaching resource set contains a first draft printable worksheet for your students to use to begin this creative writing assignment. Even though this is a short poetry activity, I still like my students to complete a first draft of their poems. Since these poetry hearts will be displayed on my classroom bulletin board, I like to minimize careless errors on student work that is posted in my classroom. After my students have written the first drafts of their poems and proofread and edited them with a partner or myself, I give my students their final draft heart templates. There is a black and white poem template for you to give to your students and a color poem template for you to use as your example that you show to your students. Valentine's Day Things That We Love is provided below. For this creative writing assignment students write two paragraphs about things that they love on their first draft worksheets. The 8 topic choices for students to choose from are: person, sport, book, movie, restaurant, game, place, and holiday. 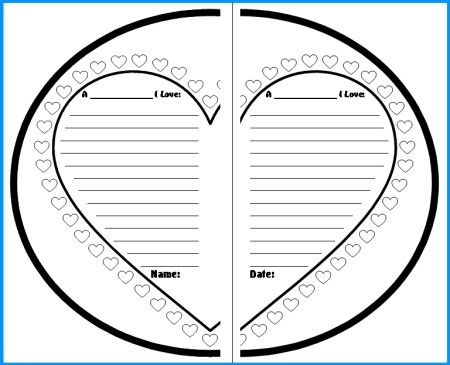 There are two final draft printable worksheets that are glued together to form a large heart inside of a circle creative writing template. There are two writing spaces inside the heart for students to write their two paragraphs. Below is an example of the final draft black and white templates for this project. Below is an example of the color templates that are included in this set and what the finished Valentine's Day project looks like when the two templates are glued together. The final draft templates measures 12 inches in width and 10 inches in height when they are glued together and cut along the circle border. Valentine's Day Poetry set is provided below. 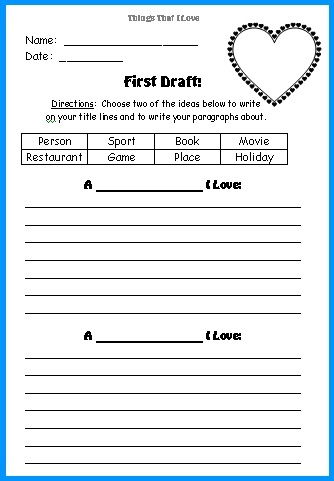 This "Valentine's Day Letter Writing"
This "Valentine's Day Someone Special"
For this writing assignment, students should choose someone who is special to them to write about. I found that if I used the word "special" instead of "love," my students were more comfortable with choosing a wider variety of people to write about for this topic. 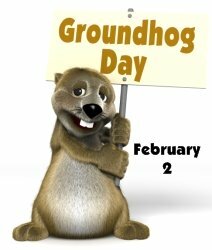 Are you looking for a fun project for Groundhog Day? I have created a separate web page devoted just to this February holiday. 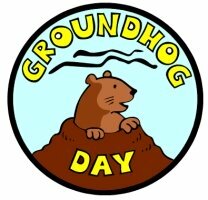 On my Groundhog Day lesson plans page, you can read a description about this holiday and watch two two videos that will help to explain the traditions and history of Groundhog Day. 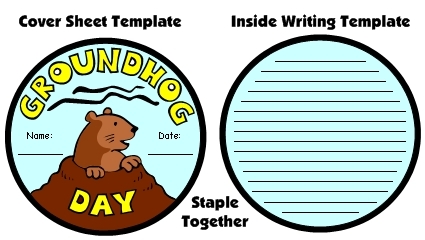 This page contains ideas for Groundhog Day writing prompts and lesson plan ideas for a project that involves your students in creating Groundhog Day booklets. Above is an example of my printable monthly calendar for February. I have designed the calendar templates in this holiday calendar to fit inside the monthly calendar pocket charts that many teachers use. The large February calendar title is a 2 page banner template that is glued together and cut out. This printable calendar set for February includes large calendar templates for the 7 days of the week: Monday (shown above), Tuesday, Wednesday, Thursday, Friday, Saturday, and Sunday. There are 11 printable calendar pages in this February teaching resources calendar set. 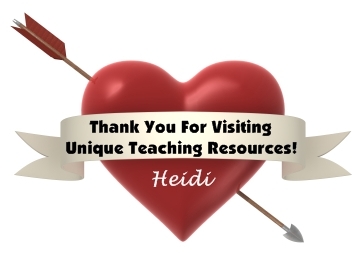 Thank you for visiting my Valentine's Day Teaching Resources page.